Have you ever noticed that no matter how hard you try to pay off your debt, somehow it never seems to happen? It’s not that you aren’t trying either. But every time you start to make some progress, yet another large bill or unexpected expense comes in and you’re back tapping the credit cards. Everything you paid down on your cards comes rushing back in. Unfortunately, this is an all too common experience. You want to pay off your debt, you’re working to do it, but something always seems to get in the way. The problem is a lack of cash reserves; an emergency fund. If you have no spare cash, credit cards will fill the void. Before you can payoff your debts, you first have to get serious about building an emergency fund. Why? When we make budget plans we often discount emergencies. We like smooth money flows: income in, expenses out, excess to pay down debt. Real life never works like that! Emergencies are like bumps in the road, no matter how hard we work to avoid them they still happen. And they cost money. The only way to insure that you’ll be able to stick to a debt-pay-off plan will be if you have an emergency fund to smooth out the financial bumps of life. This is why you need a well-funded emergency fund before you even undertake the job of paying off your debts. One of the difficulties of paying off debt is that it’s a long term process. For most people, it’s not like you can make extra principal payments for a few months, then voila(! ), the debts are all gone. For most people, getting debt free will take years! That will require a long term plan. That plan has to include not only making extra payments on your debt, but a host of other financial adjustments as well. You’ll have to reduce your living expenses to find the money to make the extra debt payments. You may resort to selling off possessions to raise cash to fast-forward the additional payments. But you’ll also have to have an emergency fund that will keep your budget insulated from unexpected expenses. Let me suggest that before you start making extra principal payments or selling off your stuff, that you first begin directing the extra cash into an emergency fund. Once you have the desired level of emergency savings, you can then begin making extra debt payments. The emergency fund will insure that your extra debt payments, when they begin, will be uninterrupted. Living on the edge of financial oblivion (large debts, no savings) isn’t a healthy place to be. When your entire financial situation is dominated by debt it can seem hopeless, especially if it’s a lot of debt in relation to your income. You may need a boost of confidence before climbing that hill. One way to get that confidence is by building a savings cushion. That won’t make your debts go away, but it will give you some protection against short term troubles, and that can give you the confidence—and breathing room—to attack the larger problem of paying off your debts. You can also think of building an emergency fund as a step in the direction of paying off your debt. Each small step in the process will embolden you with the next one. This is the most important step in paying off debt. Before you can consistently pay off your debt, you first have to put an end to your dependence on it. Part of this will come from learning to live on less money. But a savings cushion will give you a source to tap when unexpected expenses hit. When you can get to the point where you no longer need to use credit cards, the battle will be half done. Once you have an emergency fund stocked, you’ll be in a position to attack your debt hard, knowing that you have some insurance in place in the form of surplus savings. Why is building an emergency fund more important than getting out of debt? Because you may not get out of debt without it. 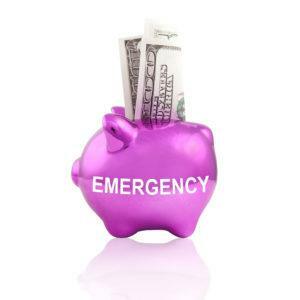 Do you think it’s better to have an emergency fund in place before you begin paying off debt?